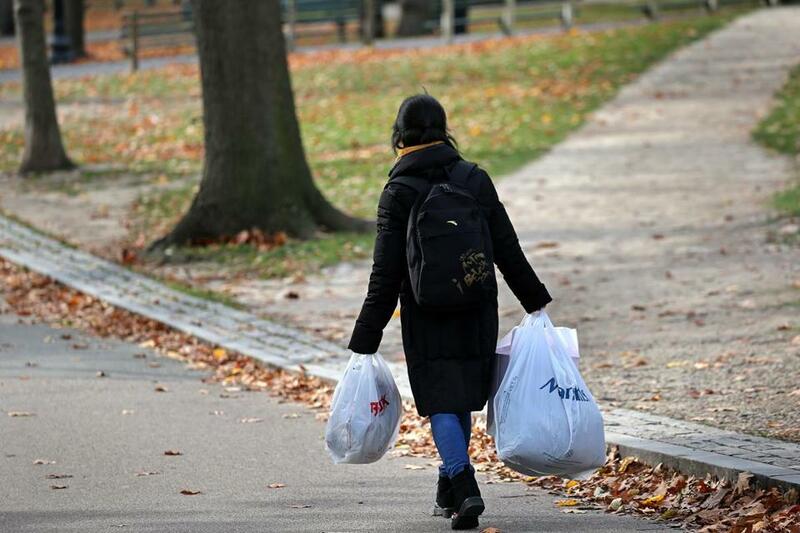 Boston recently banned single-use plastic bags, a step toward a goal of being carbon neutral by 2050. Imagine having to drive an electric car, if you drive a vehicle at all. And if you drive into Boston, you’d have to pay a congestion fee. Every building in the city would be retrofitted for energy efficiency. All fossil-fuel burning appliances would be converted to electric, too. And we would cut down on many items that end up in the trash, like the city did recently with plastic bags. They are bold measures for even the most environmentally conscience resident, but they may be necessary if the city wants to reach its goal of going carbon neutral by 2050, according to the Boston Green Ribbon Commission, which is releasing a report Tuesday. “This analysis demonstrates that we can reach our goal by 2050, but only through a coordinated and concerted effort among the public and private sectors – and we have to start now,” said John Cleveland, executive director for the commission, which includes business and civic leaders who help the city develop strategies for fighting climate change. Mayor Martin J. Walsh requested the analysis in 2016 to help shape the city’s Climate Action Plan, and it offers the first outline of steps the city must take to realistically reach its goal of going carbon neutral in three decades. The report, called Carbon Free Boston, was completed in partnership with Boston University’s Institute for Sustainable Energy and will be released at a panel discussion at the Museum of Science. City officials said they will use the report as a roadmap as they finalize the Climate Action Plan over the next year. Going carbon neutral generally means having no net addition of emissions after balancing out existing carbon gases with efforts — such as planting trees — that pull carbon from the atmosphere. What is clear is that the city must do more, beginning now, environmental advocates said. “We really have no choice,” said Elizabeth Turnbull Henry, president of the Environmental League of Massachusetts, who was not part of the analysis but had been briefed on its findings. Henry acknowledged that some of the proposals are bold, such as the demand that tens of thousands of buildings be retrofitted. But she also said that the work could provide economic and quality-of-life improvements, beyond the environmental benefits. “As we enter a new era of our city’s history, we’re planning for storms, climate change, and the environmental threats the next generation will face,” the mayor said. The analysis said changes need to be implemented in key policy areas, such as transportation and the city’s building stock (which together account for more than 90 percent of the city’s greenhouse gas emissions) and in recycling and trash disposal. First, the city must lower demand, for instance by increasing efficiency in buildings. Then, the city must cut down fossil fuels that contribute to greenhouse gas emissions by converting all internal combustion appliances to electrical, for example. And, lastly, the city must purchase 100 percent clean energy, from sources including wind and solar power, beyond the 80 percent standard that will be required under state law by 2050. “You have to make sure the electricity you’re supplying to the people of Boston is free of greenhouse gas emissions,” said Cutler Cleveland, the report’s principal investigator and a professor of earth and environment at Boston University. He said the strategies could have secondary effects such as helping residents reduce utility bills – more than $600 million by 2050, according to the analysis. Boston’s 86,000 buildings account for 75 percent of total city emissions. Even with new development, which will have to meet energy efficient standards, 85 percent of the buildings that will be standing in 2050 already exist, meaning they will have to be retrofitted to be more efficient and converted to electric. Meanwhile, 98 percent of the work would need to be done by private building owners, putting the burden on city leaders create incentives for the work, through educational campaigns and by providing resources. “To reach carbon neutrality, you have to do that for every building in the city,” Cleveland said. Of the greenhouse gas emissions from the regional transportation system, nearly 70 percent come from the use of personal vehicles. Also, three quarters of the emissions from cars are for trips that originated outside the city. “As you look at these very long trips commuters make, there is a challenge to reduce greenhouse gases,” Cleveland said. The analysis suggests encouraging people who drive within the city to walk or ride bikes. Anyone driving into the city would be encouraged to take public transportation or face a congestion fee or parking fees for non-Boston residents. The analysis shadows a separate review by a city task force that recommends cutting the amount of waste that goes to incinerators by 80 to 90 percent — mostly by increasing recycling and composting. That and reducing overall solid waste by adjusting behaviors could reduce greenhouse gas emissions from solid waste by more than 90 percent, Cleveland said. “It’s encouraging people to believe in changing their behavior with consumer waste in general,” Cleveland said. Peter Fox-Penner, director of Boston University’s Institute for Sustainable Energy, said the city should also push for more research and innovation — including finding more ways to create energy, and store it. Milton J. Valencia can be reached at milton.valencia @globe.com. Follow him on Twitter @miltonvalencia.